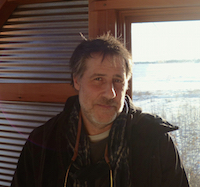 Kipp Wessel’s essay “Meeting the Wild Things Where They Are” appears in Writing for Animals. 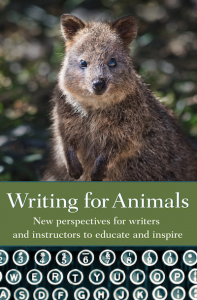 Q: In what ways has your writing changed as your knowledge and awareness of animals has evolved? A: I’m a fiction writer, and my strongest artistic instinct is to write solely from experience and imagination. But when it comes to wild things, I also incorporate disciplined research. I want the animal lives in my work to live and breathe and shape their own personality as much as anything else I write about — I want them to be just as complicated and messy and unpredictable. I don’t want to be a writer of test-tube wildlife. But I also want to make sure their presence and energy are grounded in the reality of how individual species cope and react. Also, when you start unraveling the layers of what animals are — that research expands narrative possibilities. The other significant change stems from how animals have changed my life. I’ve never shared my life with an animal I haven’t fallen in love with. Completely and irreversibly. I don’t know if I’ve ever met one I haven’t fallen in love with. And when you fall all the way into that dynamic, when you love someone with your complete heart, no matter who it is, it changes you. The animals in my life are constantly teaching me about attachment, play and meaning — and those are themes and qualities infused in my creative work. A: Here’s the most important thing I try keep in mind — the act of emptying it. My preconceptions. It’s so easy to interpret the behaviors of other beings through the veil of our own instincts, drives and emotions. We’re hard-wired for that. I’m pretty sure all species share that myopia. But when we misinterpret wild things and places within our work, when we don’t do the hard work of setting our preconceptions aside, our work doesn’t just risk inauthenticity. It can also mute or miss the raw and untamed energy we could be tapping. I remind myself to forget what I think I know, but also be suspect of what others think they know. About animals. Including biologists and scientists. Because science gets it wrong, too. We are constantly underestimating the intellectual, emotional and social lives of animals. When we wade into the lives of animals, it’s a deep pool. We have to be open minded about all that’s hiding in those waters. A: When I immersed myself in the subject of grizzly bears for my novel, I was moved by Doug Peacock’s Grizzly Years: In Search of the American Wilderness. I really admired how he used his own personal curiosity of grizzlies to fuel an intense and vital exploration of the animal. Rick Bass writes beautifully of wild things (and everything else). He has written several books on animals that unfold like mysteries. And his eloquence when writing about the wilderness where wild things thrive serves as inspiration and a nudge for us to make sure these unique places, and the animals within them, remain. Mary Oliver writes beautiful poems about our connection with animals. Jane Goodall demonstrates equal parts compassion, study, patience, and nothing short of sainthood. Those are a few I admire. Q: In your essay, you write that animals are as sentient and multifaceted as humans, if not more so. What in your own experience with animals brought you to this realization? A: Every experience. Every time an animal has stood or crouched or bounded in front of my eyes, I’ve only viewed them as fascinating worlds with their own complex emotional lives. But I often wonder that question from the opposite direction. What is it within the human subconscious or ego that pushes us to subvert the sentient truth of animals? What inspires us to deny the emotional capacity of species separate from ours? For what purpose? Because it’s not our initial reaction. Watch a child observing an animal, before that child is verbal, and her entire being is locked in wonder. The child sees the animal as the individual being it is. She doesn’t question if the animal feels or is conscious, because both things are so obviously staring back at her. She doesn’t weigh the animal’s existence, abilities or merit on a scale against her own. Her sole response and interest is contained in the act of seeing the animal. She asks: What are you? Who are you? Both questions. When I was four years old, I came face to face with my first wild rabbit — a furry, piked-ear alien that vaulted and then froze in the tall grass of our backyard. The two of us, young child and rabbit, stumbled into that moment on equal footing. Between us, our astonishment was divided evenly. I stared into the rabbit’s wet, round eyes. My breath clutched in the hollow my chest. I watched her twitching, soft nose and the way her whiskers trembled the wristwatch drumming of her heart. That’s the moment I try to experience every time I’m fortunate enough to find my way into the presence of an animal. It’s a bi-directional moment. We observe, contemplate and react to each other. Me to her — she to me. If she isn’t conscious, how can I be? It’s both of us or neither. We’re either in this together, or neither of us is. Animals feel. They think. They play. They attach. They mourn. They are. Animals are sentient, fully conscious beings that demonstrate a tapestry of emotions, from the pronounced ones of joy and grief, to the more nuanced ones of empathy and worry. They feel pain. They suffer. They collaborate and compete. And those are just emotions and behaviors we have in common. Imagine the universe of others we don’t share or aren’t even aware of. They are individual nebulas of personalities, emotions, and perceptions. And here’s the thing — the sentient ability of animals doesn’t confine or constrict the gravity of our own weight in this shared universe. Darwinism needn’t be garbled into interspecies cage match incoherence. Our continued understanding and appreciation of the complex and diverse beings sharing our homes, yards, and planet only amplifies the significance and possibility of our own experience and existence. It widens, not lessens it. Maybe that viewpoint isn’t universally shared. I don’t know. It’s impossible for me to see it any other way.